The utterly mundane task of bringing a garbage can back from the curb put a broad grin on Guy Mazzanti’s face Monday, Jan 7. Seaside Heights’ retired police commissioner had been living with a daughter in Maryland since Superstorm Sandy pummeled the shore in October. The storm created memorable scenes of destruction like the roller coaster that plunged off a collapsing amusement pier and still sits in the ocean a few blocks from his home. Mazzanti was one of a handful of residents who took advantage of long-sought permission to move back home permanently. Monday — nine weeks after the storm made landfall — was the first day residents could begin so-called “re-population” plans in Seaside Heights, as well as parts of Toms River and Brick. Even now, Mazzanti isn’t in his permanent home. That building took on more than 2 feet of water and still needs major repairs. 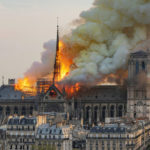 But he rented a condominium and on Monday he greeted friends he hadn’t seen for more than two months. “It’s paradise, being home,” Mazzanti said. “I still can’t believe how 24 hours can make such a difference in our lives,” he said, referring to the storm. Tony Vaz, a Seaside Heights councilman, also has not been able to return to his house. He, too, rented a condo until repairs can be made to his home. Wearing a fleece New York Jets top, Vaz joked about having withstood two disasters last fall: the storm and the beleaguered football team’s season. He’s looking forward to normalcy in a neighborhood where there are still very few people. 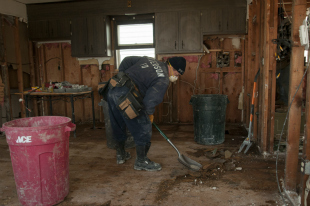 A member of the Patterson, N.J. fire department helps with the clean up in Seaside Heights, N.J., in the wake of Sandy. Photo: Patsy Lynch/FEMA, Nov. 26, 2012. Al Poane, a retired police officer, has spent his entire life in Seaside Heights, except for the past nine weeks. Very few residents of Seaside Heights or the rest of the barrier island that was devastated during the storm are back in their own homes. 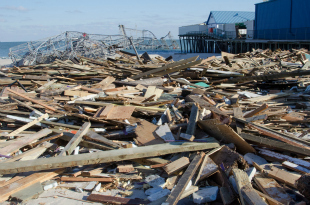 The Ortley Beach section of neighboring Toms River sustained some of the worst destruction in the state. Of the 2,600 homes there, only 60 escaped damage, and residents still can’t return. Parts of the Brick barrier island also got the all-clear sign on Monday, but even fewer residents appeared to have returned to an area defined by the more than 100 bungalows that burned during the storm. Also on Monday, public access was restored to the southern section of Mantoloking, another hard-hit town. But motorists had to detour onto a bridge leading out of town unless they were residents or contractors working on one of the hundreds of storm-damaged homes. There are still police checkpoints, and town-issued photo identification cards are needed to get into the northern half of town. Jim and Joanne Murphy were among the very few residents who were able to move back into the Normandy Beach section of Toms River. Having built their home in May, they employed tough building standards that called for, among other things, a higher elevation than their neighbors. Aside from a caking of mud on the outside, their home was fine. Bill McEnery came to his house Monday, but still could not move in because the gas, water and electricity have yet to be restored. His landlord promises they’ll be turned back on soon. And when that day comes, McEnery knows exactly how he’ll celebrate. Happy to be home. Sounds like what folks in Berlin said after the war. And just about as pretty a sight.